Update 2018: This article is obsolete now, mainly because Plasma5 replaced the Plasma4 desktop with a better theme: Breeze (surprisingly a bit in the vein of what I was designing in this article, good! Now I use the default theme). 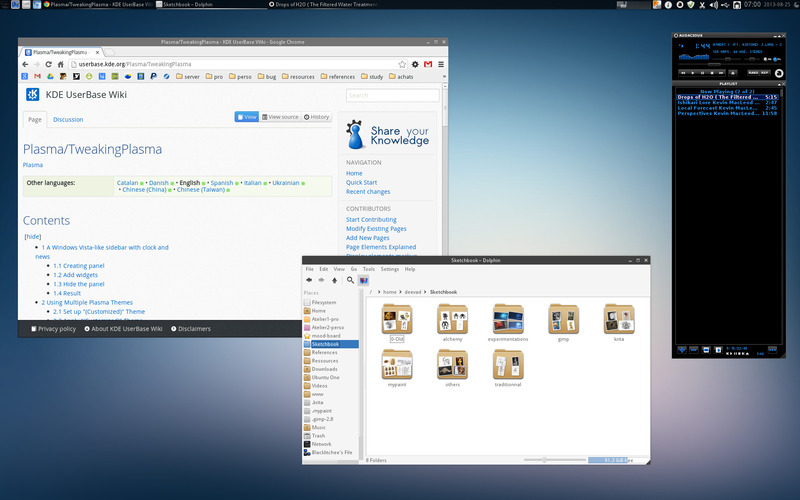 I'll keep this article as a memory archive: back in the context of 2013, my GNU/Linux KDE desktop theme was looking really modern and ahead of its time. Unzip in a temporary directory of your choice, just to load them later on the process. in the search field , search for oxyfaenza , my KDE Faenza integration little project. Install it ; the icon pack is large ; and will take time. Have fun customising and sharing your own setup. Feel free to use comments here to share links of your screenshots and setups, or share your taste, and fav ressources. mentioned at the end of the article, 25 august 2013 . Truth to be told, if it wasn't for the default wacom configuration tools in KDE, I would have picked a different distro. Early this year, I posted a comment in your Mint 14 guide about my struggle with having a tablet and cintiq working together. When Mint 15 KDE arrived, I was blown away: no need for a script nor calibrating the coordinations in the cintiq anymore! I still have to unplug the tablet to get the cintiq right, but it performs just perfect in MyPaint and Krita. Some other distros I've tried simply caused my tablet to hang (unless I was doing something wrong that I'm unaware of). The icons are Potenza, wallpaper by David Domingo Jimenéz. 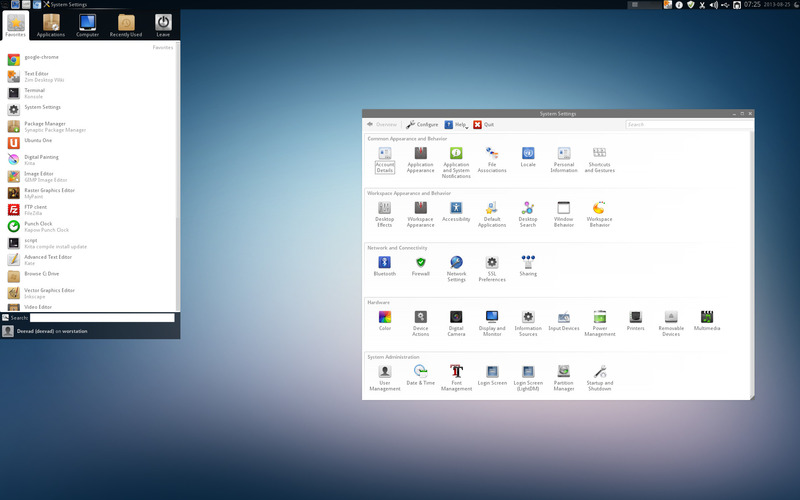 @Tristan : Cool setup and thanks for sharing your good feedback about the Wacom module in KDE with Mint15/Kubuntu13.04. Next family ( if not actual , I still have to test it ) of Gnome 3 will have a better Wacom configuration panel, and I'm happy I had a little influence with showing the advantage of the KDE panel at LGM in Madrid this year. Still using TVPaint, too, new update with an interesting new "projection" setting for brushes, works great for wet brushes, when you tilt your stylus it spreads the paint out. I know it's not free, but it's the only decent paperless animation app on Linux. @Brett W. McCoy : Sure ! All 'buntu flavor received a fix 10 day after the 'mini drama'. So it's really fixed. XFCE is still with Openbox/LXDE the D.E where the painting apps are the more fast. 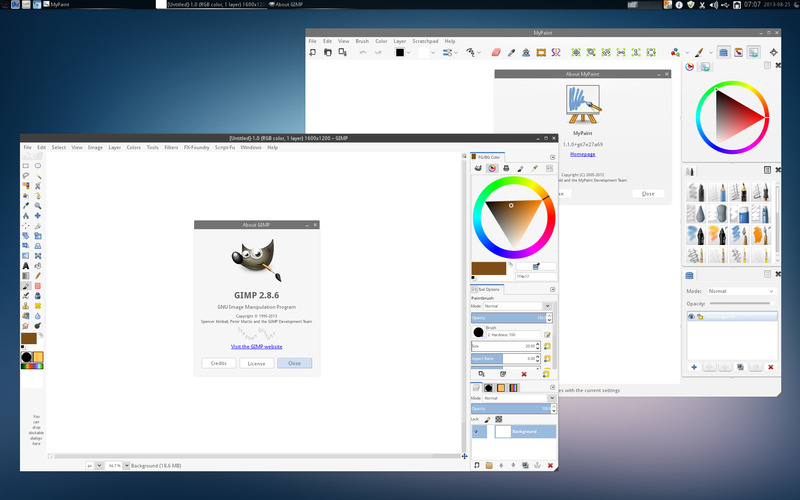 On KDE, all apps using Cairo or GTK tend to lag for painting or paint on screen complex widget or path , aka Gimp , Mypaint, Inkscape ( while it's fast on XFCE, for both KDE apps and GTK ). 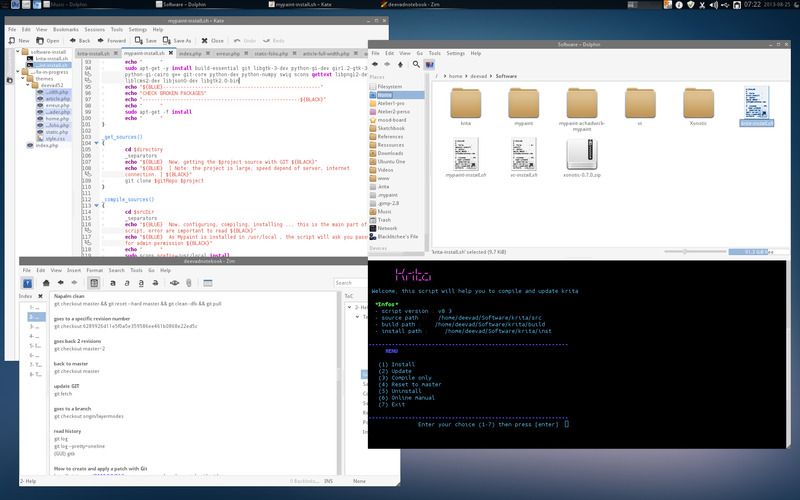 So, I 'll tend to go back to Ubuntu Studio , I think or any XFCE based distro. No problem for TVPAINT, I was a beta tester for the team back 2007~08 or around ; and came from Mirage from Bahaus. 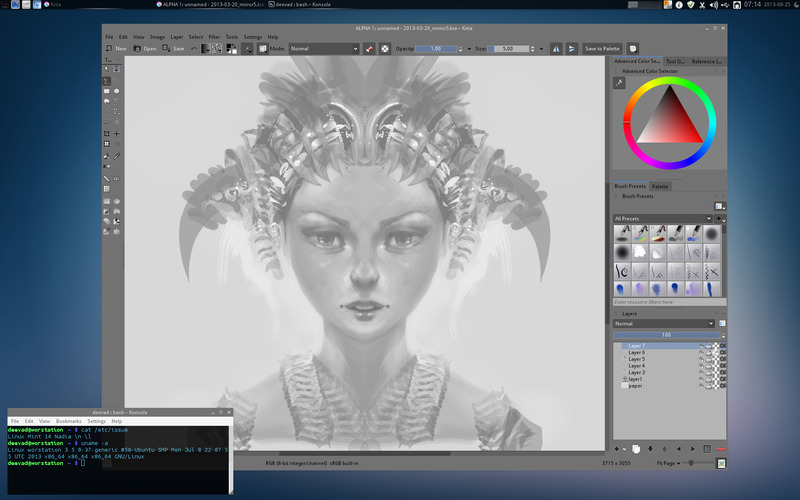 I really like Tvpaint, still for me the fastest proprietary apps for drawing & painting, the engine is ultra optimised. If I had to run a studio for an anime or small movies on my own , I would certainly purchase a bunch of Linux license of it. Perfect swiss knife for video retouching too , and compositing. But for the moment, my comission are more about video games and printed artworks. I'm using Ubuntu + E17，wacom panel can be used. Krita is only used to convert CMYK. I am using it now and love it. I've fiddled with something for many years, and that is how to change the color of the GUI for Amarok. a) I can't seem to find the particular script or folder or whatever that assigns the color to the system colors. b) do you happen to know off hand the pathname to the script? c) could you make a script, and also, give instructons on how to install it so that the braver folks among us, who don't mind borking our setups could manually change the color assignment. One would have to also know whether the color codes were html, rgb etc. But, anyway... just a question and it might not be doable, because there are quite a few references over the past few years about how in newer versions the devs were able to "get it to use the system colors" etc. Again, nice stuff, and thanks ahead of time for any comments. @woodsmoke : thx ! As far as I remember ( I'm on Gnome-Shell now ) ; the color script (inside the zip ) was loaded via the graphic user interface of KDE apparence / color , in preference dialog. Something like a 'import button'.